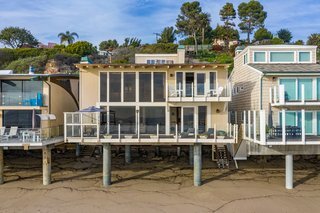 Actor Barry Williams, known for playing Greg Brady on ‘The Brady Bunch,’ is selling his beachfront property in Malibu. 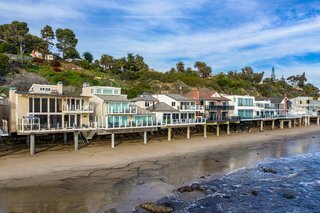 Located in the gated, beachfront enclave known as Malibu Cove Colony, this three-bedroom, four-bath, 2,808-square-foot home with a celebrity pedigree includes an open floor plan and expansive ocean views. 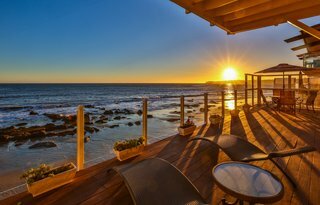 Located in a coveted, beachfront, gated community, this Malibu home is surrounded by ocean views and miles of walking trails. Supported by concrete columns, the home hovers above the sandy terrain. An expansive ocean-front deck blends indoor and outdoor living spaces. 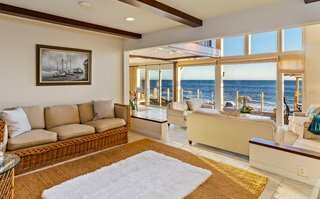 Open living spaces, exterior decks, and grand windows embrace the ocean views. A two-story living room with a dramatic stone fireplace and double-height window wall is the focal point of the home, bringing in lots of light for airy interiors. The two-story living space is open to the bedrooms above. A full-height wall of windows draws the ocean views inwards. A dramatic, two-story stone fireplace anchors one end of the living room. 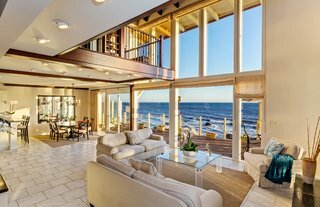 An open floor plan provides continuous living spaces with uninterrupted ocean views. The grand, two-story living space is filled with natural light. 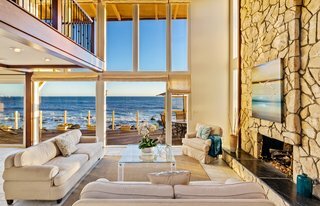 Living spaces extend outward onto the home’s large, oceanfront deck—the perfect location for soaking up the sunshine and enjoying Malibu's panoramic views. Miles of walking trails and water activities are right out the door. The oceanfront deck provides an idyllic spot for enjoying the ocean waves and watching the sunset. A chef’s kitchen is open to the living and dining spaces, complete with stainless-steel appliances, a Sub-Zero fridge, double oven, custom cabinetry, and a center island with a range and stainless-steel hood. 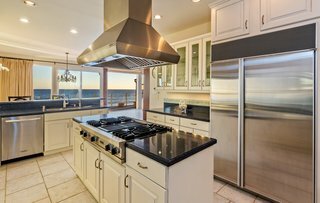 Ocean views can be enjoyed while cooking or entertaining from this chef's kitchen. 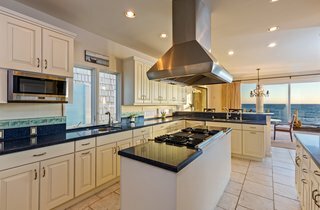 The recently updated kitchen includes top-of-the-line appliances and finishes. Upstairs, a fireplace, large closet, updated bath, and two private decks create an idyllic master suite. 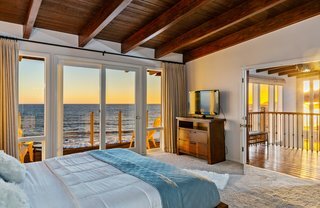 Two additional en-suite bedrooms have wood-beamed ceilings, either mountain or ocean views, and are perfect for kids or guests. 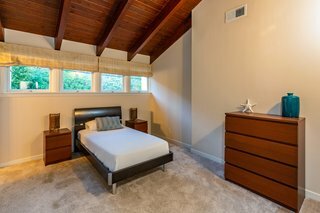 The master suite includes two private decks, a fireplace, large closet, updated bath, and wood-beamed ceiling. 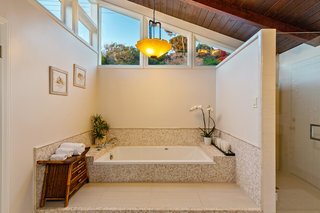 The spa-like master bath has been recently updated. Clerestory windows draw natural light into the space, while still providing privacy. The wood-beamed ceilings carry into the additional en-suite bedrooms which feature beach or mountain views. 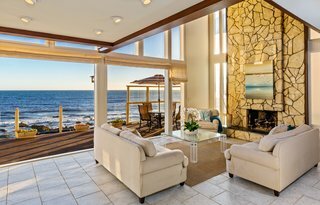 With a dreamy oceanfront setting and stunning sunset views, this open-concept home has great potential for its new homeowners to make it their own Malibu beach house. The property is currently listed by Irene Dazzan-Palmer, a Coldwell Banker Global Luxury Property Specialist, and Sandro Dazzan with The Agency for $6,375,000. Know of a home for sale or rent that should be featured on Dwell.com? Find out how to submit to our editors.